Except for the drive to Quebec City from Sherbrooke, where 50 kilometers from our destination the driver of a semi waved frantically to indicate something was wrong with the Grey Ghost–a flat tire. CAA to the rescue. Between sign language, pointing, muttered French and English, it all worked and we were on the road again in an hour. Except for the weather, which ranged from scorching one day to full-on rain the next. The trailer awning, left out after a day of sun, filled with rain that night as a torrential downpour soaked the campsite. As The Dude poked with our floor mop attempting to drain off the water, a cracking sound occurred as the right arm broke under the weight of the water. Monsieur Morin to the rescue. 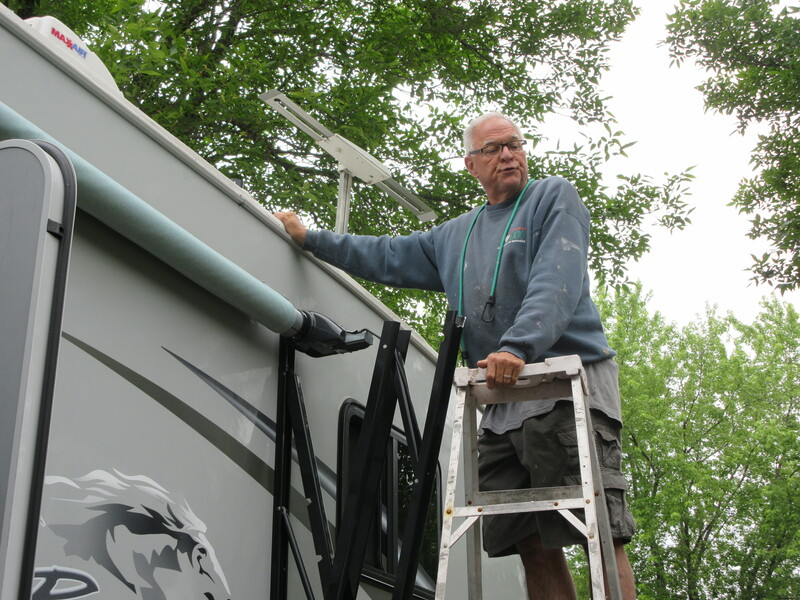 The ex-banker turned RV repairman spent the afternoon pulling and prying, whistling and occasionally shouting–“Yes.”–as he worked through the problem of reattaching the awning arm so it wouldn’t come loose during our travels, taking out the station wagon next to us. Except for The Dude’s brief stay in L’Hospital, as blogged previously, which left The Dame with nothing to do but shop at the Laurier Mall across the street, a hardship she somehow endured. 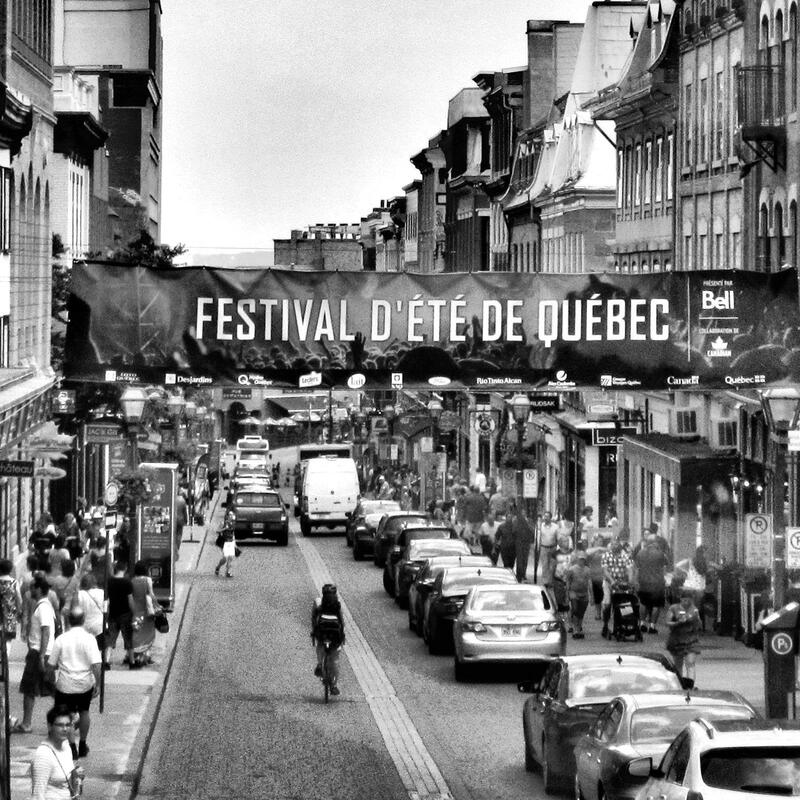 Now for the great part of Quebec City, and it is a great city. The campground had a shuttle service taking camera-wielding tourists into the city and dispersing them to other tour buses in town. 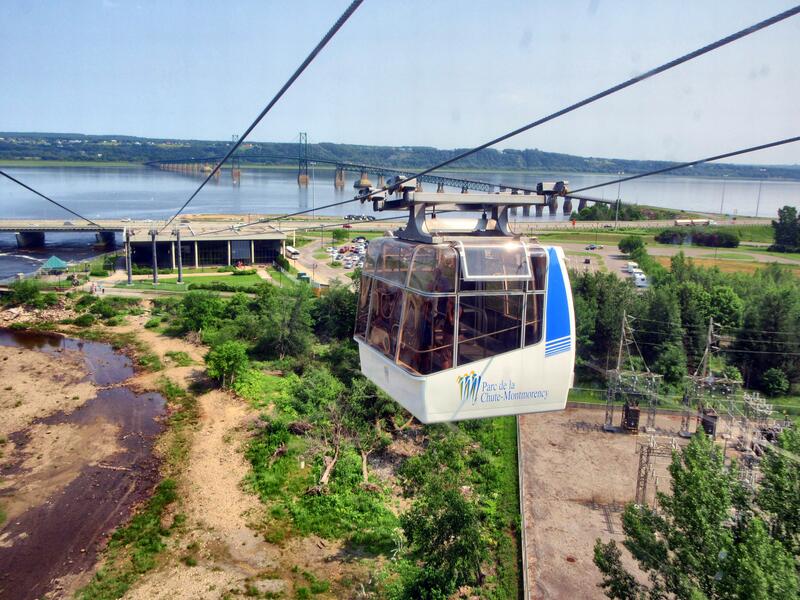 Having experienced the freeway system surrounding Montreal, let’s just say that Quebec City’s is worse. It involves two bridges one apparently pre-war with such narrow lanes that you were constantly playing chicken with the car beside you. 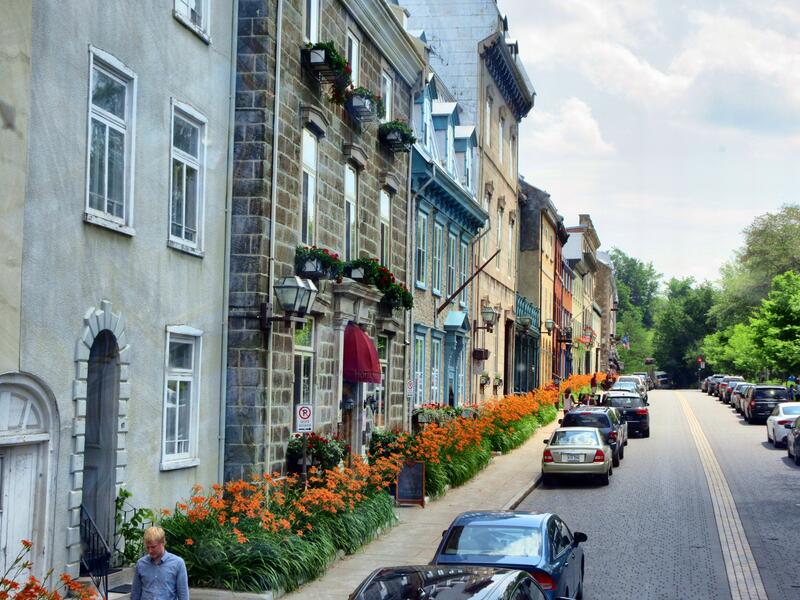 Once you get to old Quebec, all is forgiven. 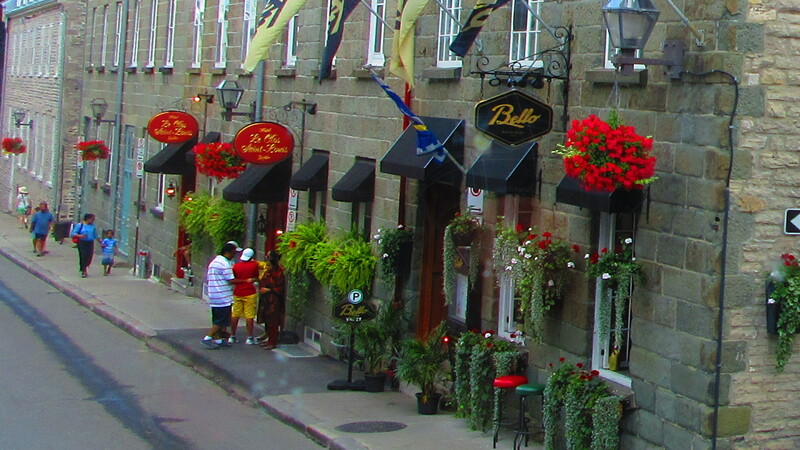 Sure, there are plenty of tourist honey traps full of Fleur-de-lis t-shirts and moose bric-a-brac to take home with you. But the impressive part is the respect given to the heritage of the place. It is a living museum within the walls that surround it. This is as close to Europe as you can get in Canada, minus the security pat-down and lack of leg room. Tiny epicuries line the narrow streets, alongside cafes with tables outside under over-sized awnings and musicians playing violins hustling for tourist coins. Massive bronze statues of French heroes we’ve never heard of abound, tourists with selfie-sticks race from one spot to another, confirming with their IPhones that the moment existed. We explore the city the first time on a double-decker tour bus, sweltering in the muggy heat. The second time is by foot, hoods pulled up over our heads against the sporadic rainfall. 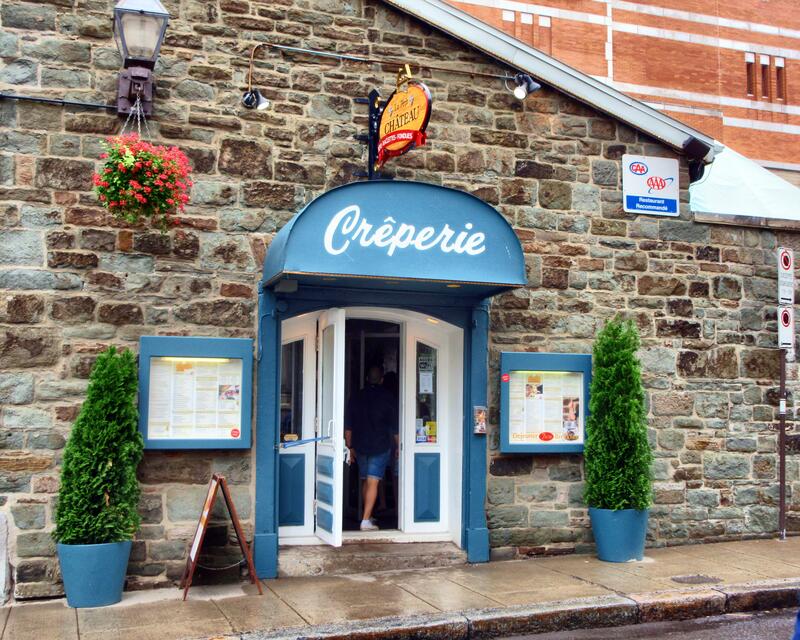 Walking through the old town over the uneven sidewalks, we have a hankering for crepes. Food cravings are weird, and constant in the Maloney household. When you are on a craving mission nothing but the object of your desire will do. We crisscross the city looking for the elusive object of our desire. 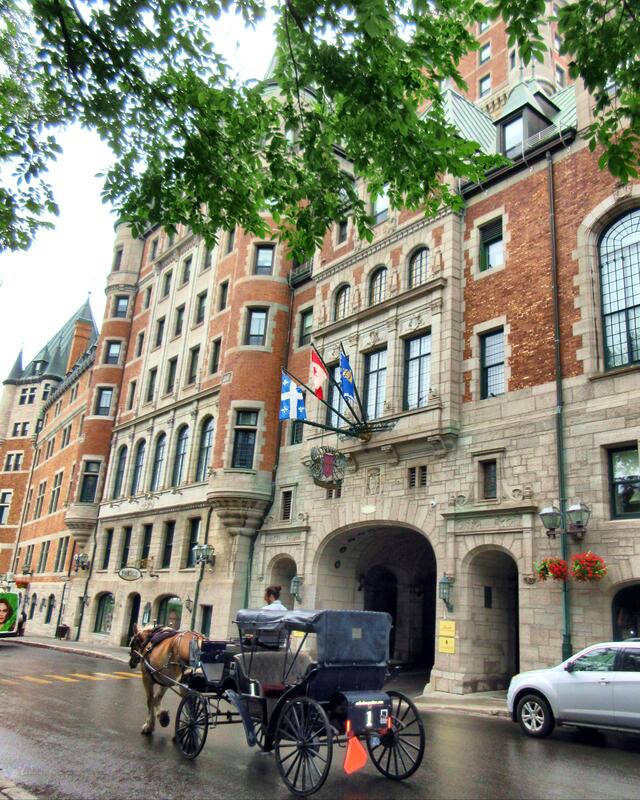 Plenty of restaurants offer Poisson, charcuterie, baguettes, crème glacee (I’ll let y’all google up those words) but after an hour of wandering and constant stops to admire a building or peer into a shop we find the Creperie at L’Hotel Chateau Frontenac. 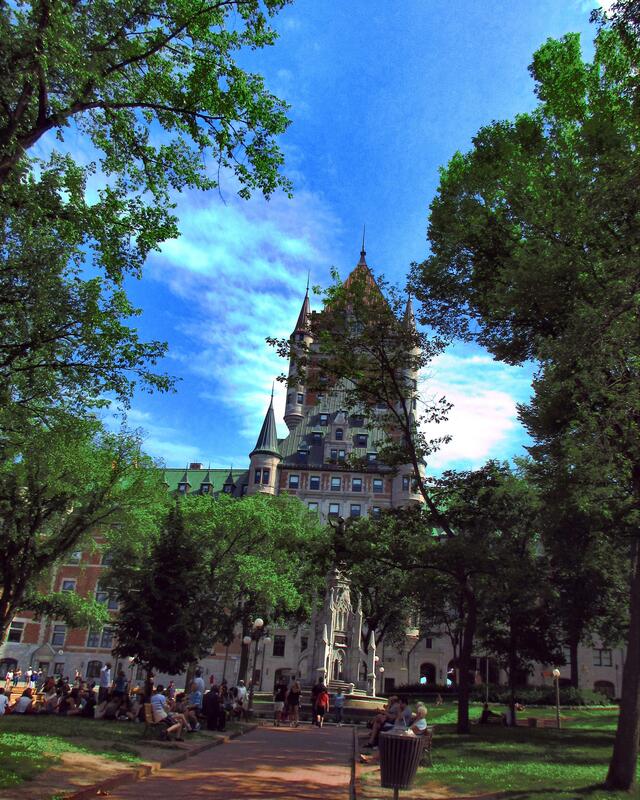 The Chateau Frontenac is one of those hotels that make me wish I was wearing Chanel and carrying a little dog in my purse. Doormen guard the entrance and it has marble flooring and exotic wood paneling and an art gallery and a beautiful old bar where rich people casually toss off a glass of forty dollar brandy and discuss the problems of getting good help. The Dude and I, wearing scuffed Skechers and baseball caps, stand out like Paris Hilton at a church social. 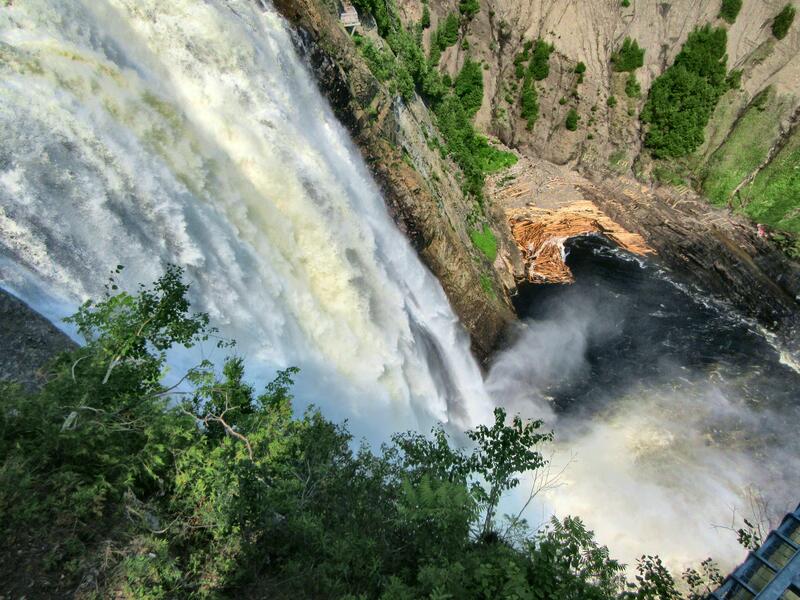 Another great thing is Montmorency Falls which, fun fact here, are the highest falls in North America at 275 feet. Aha you say, ‘wrong grasshopper’, Niagara has the highest. Non, monsieur, Quebec’s are higher but Ontario’s are bigger and thus more well known. See, size does matter. 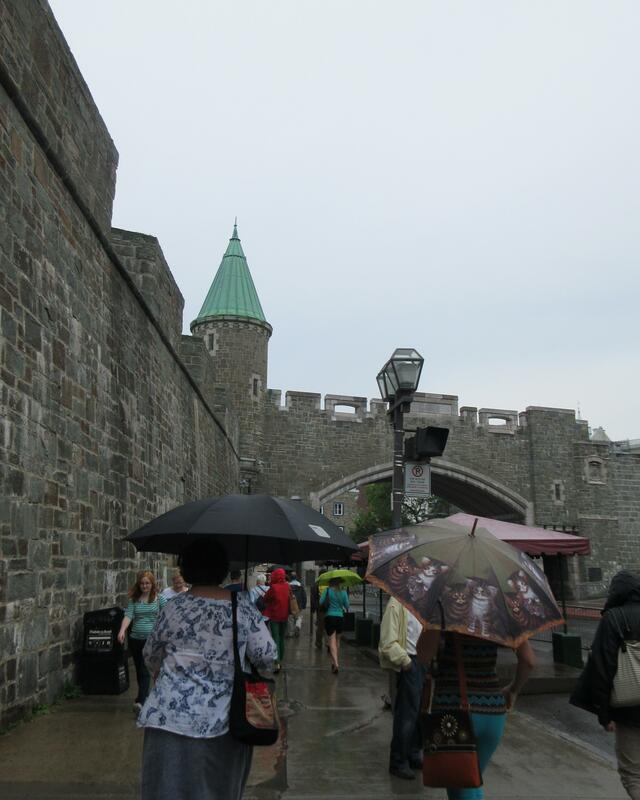 Great blog on Quebec City – have to put that on the “Bucket List”. Always enjoy reading your posts! With all the stuff weâre crossing off, we may have to get a new bucket!